Summer is coming to the end and we are feeling autumn is on its way. We may have to wait for sun bathing and outdoor swimming till next year, but hey, we still have BBQ to enjoy; in fact, there is more variety of seasonal food available in autumn! Today, I would like to write about urban BBQ venues in Tokyo and surrounding areas. 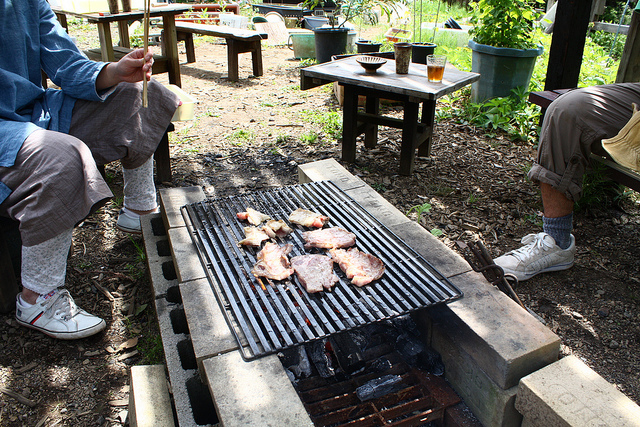 BBQ is always the best to do in the centre of nature, full of green with many friends, but if you would like to enjoy easy one not too far from the centre of Tokyo especially when you visit Japan from overseas, where should we go? It seems there are several places but based on an article, I would like to write about a couple of places recommended in the article! First place is WILDMAGIC in Koto-ward. According to the article, as I mentioned earlier, you don’t have to bring anything here (to be more precise, you are not allowed to bring your stuff in here). You can enjoy a series of meat such as churrasco, T-bone steak, and turkey leg! Venue itself has American taste with painted container and vintage tent, so for those people who would like to enjoy BBQ but don’t have any tool, this will be a nice convenient option 🙂 This option with cooking tool and venue fee cost is available from 4,000 yen (equivalent to 37 USD). Another place is called Shiokaze Park in Odaiba. Good thing about this place is that you can enjoy sea view while enjoying BBQ! Shiokaze Park is one of the largest parks in maritime sub-city centre of Japan, so there are 2 large car parks which can accommodate 408 cars in total. You can also book covering just in case it rains, too. Fee is from 2,500 yen (23USD) for male. In addition to a wide range of cooking tool, you can have meat, seafood as well as paella and pizza making kit, too! Eating out in restaurants is good, but this kind of non-touristy fun may also be good to have a fun with a big group of friends and family. If you are coming to Japan with your friends/ family or meeting up with people in Japan, you can remember this can be one option to explore local people’s life!